Porsche continued the winning streak that began at Le Mans as the FIA World Endurance Championship circus headed to the USA for the first of four overseas races that would conclude 2015. 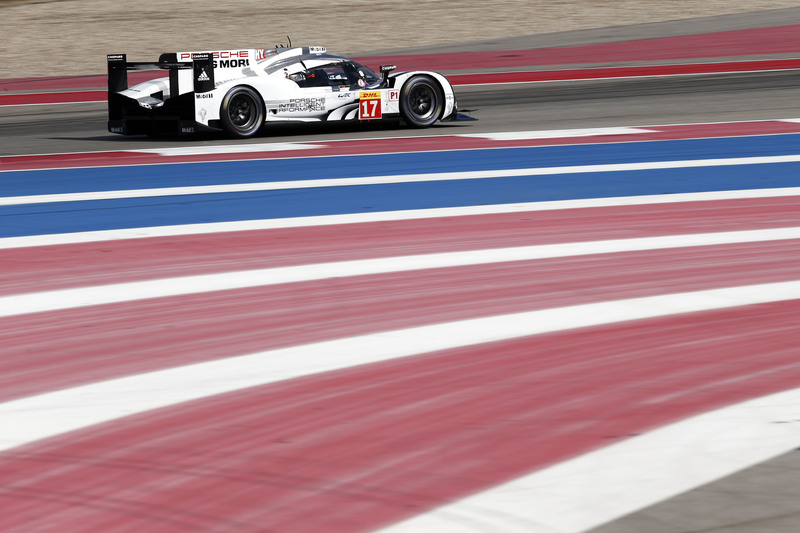 Leading from pole position, it looked like the Six Hours of COTA was going to go the way of Neel Jani, Marc Lieb and Romain Dumas in the no. 18 Porsche only for an electrical issue with just 35 minutes left to leave them down in 12th. This paved the way of the no. 17 car of Mark Webber, Brendon Hartley and Timo Bernhard to triumph (though only after chasing the Audis back down following a messy pit stop and penalty for Webber) closing the gap in the drivers’ and teams’ standings to the no. 7 Audi crew. The GTE-Pro class was a more straightforward affair with a intra-Porsche battle between the two factory Porsche 911 RSRs of Patrick Pilet and Frédéric Makowiecki, and Richard Lietz and Michael Christensen. While it was the no. 92 car of the former duo that led early on, their Austro-Danish teammates rallied in the second half of the race to take the lead and the no. 91 crew’s second victory in a row. The victory meant that Porsche headed to Japan just two points behind Ferrari in the manufacturers’ championship and with Lietz in an even more comfortable position atop the drivers’ standings. A wet-to-dry race at Fuji International Speedway saw another victory for the no. 17 Porsche 919 Hybrid. Once again though, it was the no. 18 car of Lieb, Dumas and Jani that starred, setting the pace for much of the race. The no. 18 Porsche initially had to cede to the no. 8 Audi during the wettest phase of the race but, by lap 71, Dumas was back in a lead that the team wouldn’t give up until the final lap of the race. Behind, the no. 17 car was once again forced to battled its way through the Audis (and the leading Toyota) on its way to second. Then, on the last tour, Jani slowed to give their championship chasing teammates another win. The wet conditions in Japan suited the rear-engined Porsche 911 RSRs with the no. 92 and no. 91 cars (in that order) leading the GTE-Pro category in the early stages. However, as the track dried out, the balance swung in favour of the lead AF Corse Ferrari 458, leaving Pilet and Makowiecki to take the chequered flag in second after a valiant performance. Christensen and Lietz would have to settle for fourth in the no. 91 Porsche 911 RSR, although the result did maintain their position at the head of the drivers’ and teams’ standings. A nearly flawless race for Mark Webber, Brendon Hartley and Timo Bernhard brought them a fourth successive FIA WEC triumph in China and with it came Porsche’s first world endurance title since 1986. On a slightly different fuel strategy to their stablemates in the no. 18 Porsche 919 Hybrid, Webber, Hartley and Bernhard dominated proceedings, securing victory when Jani, Lieb and Dumas were forced to make a late splash-and-dash pitstop. The sister crew’s second place helped Porsche to wrap up the 2015 manufacturers’ crown with a race to spare, freeing the team up to focus on the no. 17 car’s chances in the drivers’ and teams’ championships at the final round. Like Fuji, the wet conditions that greeted teams in Shanghai suited the Porsche 911 RSRs, with Lietz and Christensen coming from fifth on the grid to secure their third FIA WEC win of 2015. Initially, as had been the case throughout the year, it was Pilet who charged through the field in the no. 92 RSR at the start of the race. However, the no. 91 entry soon rallied to find itself in the lead. The no. 92 car’s chances of a win disintegrated when Makowiecki spun down to sixth place but Pilet again was a man on a mission, recovering to second by the time the chequered flag fell. The season finale was perhaps Porsche’s hardest FIA WEC race since the Six Hours of Spa in May as the no. 17 919 Hybrid struggled with a throttle actuator problem. Hampered by this recurring issue, Webber, Bernhard and Hartley put in a monumental effort to eventually cross the line in fifth place, a result that would be good enough for the title should the no. 7 Audi R18 fail to win. Thankfully for them, the no. 18 Porsche of Jani, Dumas and Lieb prevailed in a thrilling dice that often saw the 919 and R18 go wheel-to-wheel during the desert night, taking their first victory of 2015 and helping their teammates to a maiden world championship success. After opting to save a set of tyres and focus on race pace during qualifying, the two factory 911 RSRs were forced to fight their way through the GTE-Pro pack during the last race of the year. While the no. 92 entry of Pilet and Makowiecki rapidly worked its way into a lead that it wouldn’t lose, Lietz and Christensen were taking things more steadily as they attempted to stay out of trouble. With the sister car on course for victory, the no. 91 crew decided to settle for fifth place, a result that gave Lietz the drivers’ crown and settled the teams’ and manufacturers’ titles in Porsche’s favour. For all the latest Porsche FIA World Endurance Championship news, make sure you check out our dedicated motorsport section during the off-season.